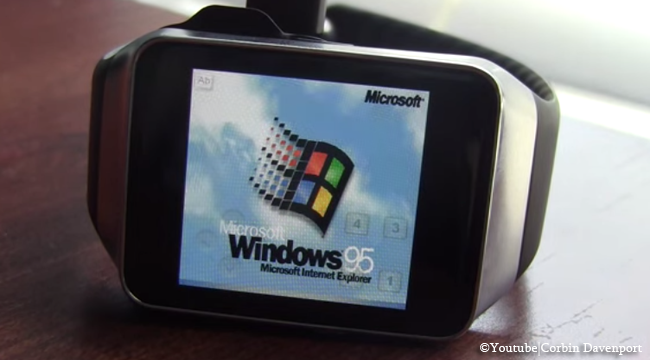 A YouTube account user was able to set up Microsoft’s classic Operating System Windows 95 on his Samsung Gear smartwatch. Corbin Davenport had shown his smartwatch with Windows 95 and how he taps the tiny screen to drag around the mouse and open the start menu. While it is cool to see an OS from 20 years ago run in a a very recent gadget, Windows 95 still viewers would notice that it is rather slow to boot up. He had showed using ‘ADOSBOX’ that is now in the Google Playstore, however it does not work properly with the Android watch, making it slow. After he hed opened an application, the OS ran out of RAM and there would be no way to configure it. SmartWatchAppCenter had appreciated seeing the old OS in a next gen device. It just shows how far our technology has advance. Davenport also ported the 90’s firt person gun shooter called ‘Doom’. He used the original ‘doom’ by the developers ELTECHS. Unfortunately, it is not available in Google Playstore anymore due to some copyright issues. He also ported Minecraft, and demonstrated how he could play it in his smartwatch. Each of the posted videos were more or less a minute, but the nostalgic feeling remains and the amazement of how these could relive in the current technology that we now have.